As a proofreader, editor, and writer, I am all too familiar with my own mistakes and slipups. In some strange (possibly vindictive) way, it’s gratifying to come across somebody else’s oopsies. 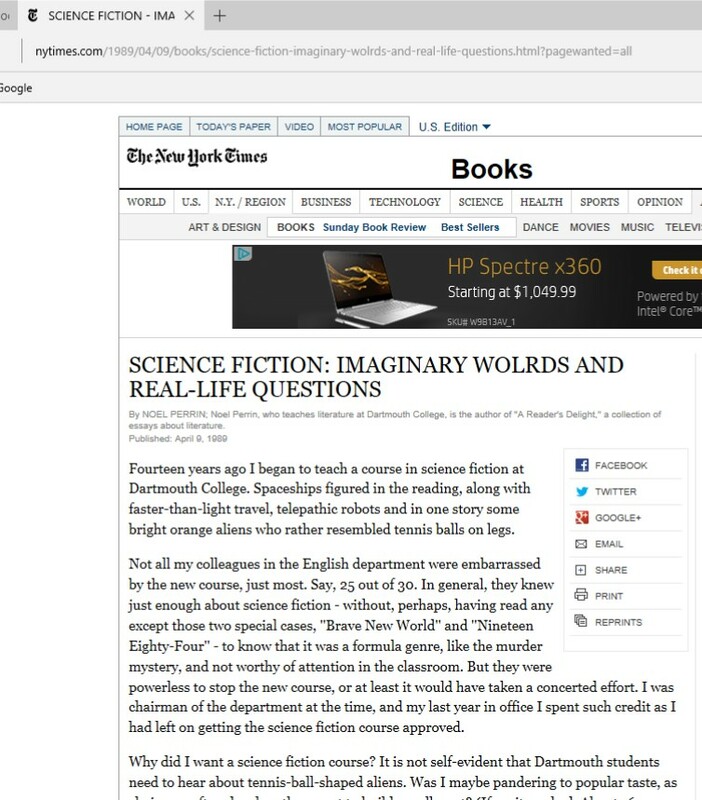 In this 1989 article about teaching a “Science Fiction as Literature” course, Dartmouth’s Professor Noel Perrin is embarrassed by a whopper of a headline. Hint: Even in sci-fi, that's not how you spell "worlds"! My friend Marc Cushman, author of many books on Baby Boomer media, is particularly burdened by my scrutiny. Before his stuff gets printed, he lets me rake it over. And he’s kind enough to let me share a couple of his mis-typings. In our recent book about the Irwin Allen series Voyage to the Bottom of the Sea, we had a reference to the “Berlin Intentional Film Festival.” Of course, “Intentional” should be “International.” Elsewhere, a studio staffer was described as having an “all encumbering role,” when “all-encompassing” was meant. And we mustn’t forget the time when one of Sid Caesar’s costars on Your Show of Shows was named “Imagine” Coca. That’s Imogene Coca, of course. Closer to home, here’s an example from a calendar produced by the Oklahoma Department of Transportation, aka ODOT. 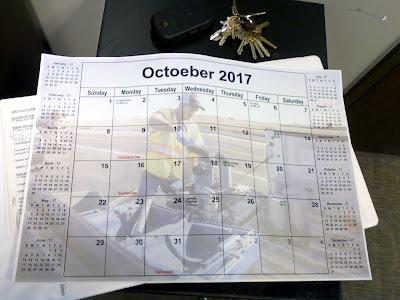 Read the month’s name again. Hee-hee! It turns out that even the Great and Powerful Stephen King isn’t above a little slip now and then. I came across a silly little thing when reading Nightmares and Damnations. 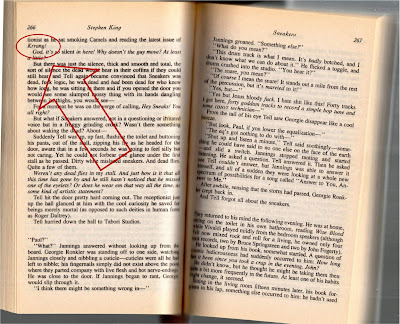 It’s in the story “Sneakers,” set in a building which has a recording studio as a tenant. 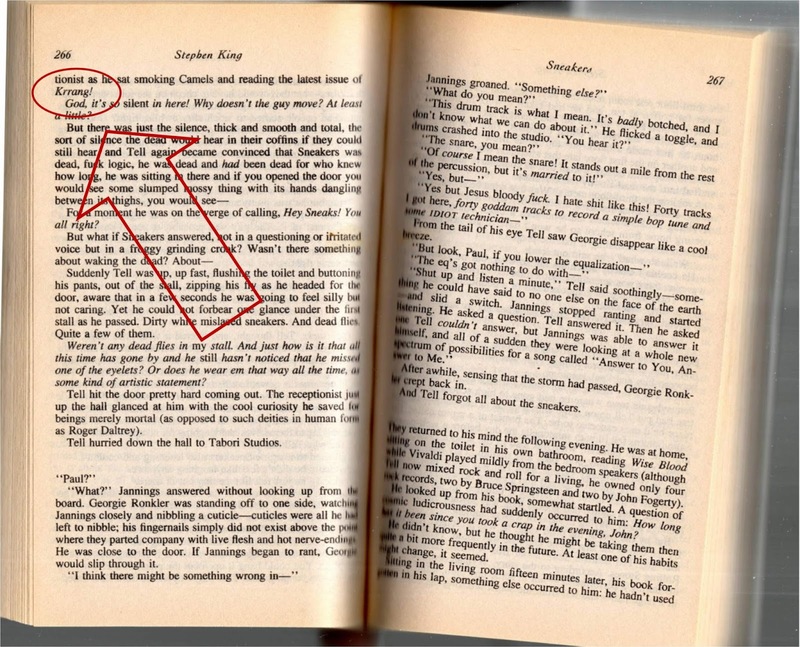 This is pages 266-67 of the Signet paperback (mine’s the first printing of this mass-market paperback). 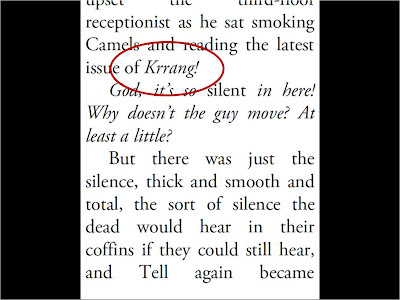 See the reference to Krrang? The thing is, this is a real magazine. It’s about pop music. 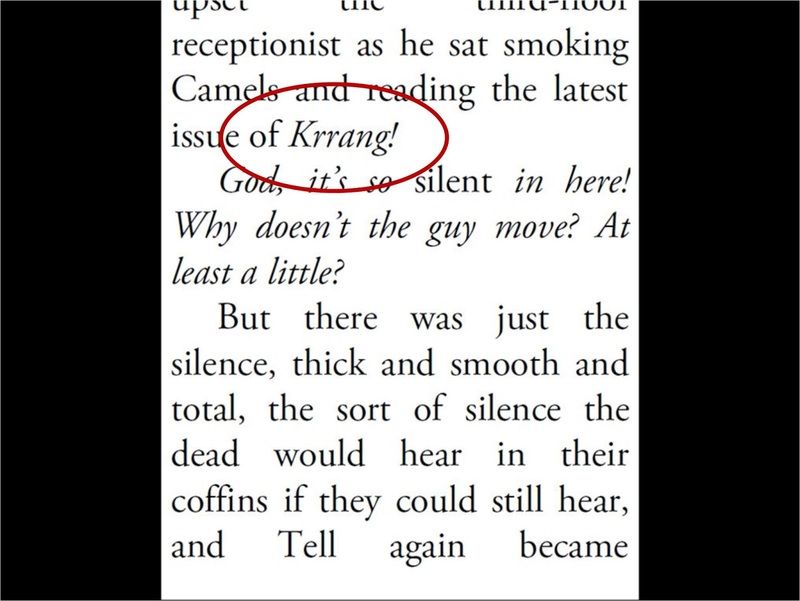 But, it’s spelled Kerrang! So, my question is ... Did Mr King get the name wrong on purpose, as a joke? Or, was the name messed up somewhere along the line from his fingers to publication? Perhaps a proofreader or fact-checker noted the mistake—but was afraid to correct The Master? Only the capricious gods of proofing know, and they ain’t takling talking! See you next Monday for more silliness.